Meraki Insight helps IT administrators optimize the end user experience, significantly reducing the time it takes to isolate network or application problems that lie beyond the LAN, and create happy, productive users. Meraki Insight requires a collector to gather the data it uses, and the Meraki MX platform can be easily upgraded to function as a collector with the addition of a new Meraki Insight license. As data flows through LAN and WAN interfaces, deep packet inspection provides valuable information at both the Network layer and Application layer, helping IT determine the true root cause with simple visibility into performance at every step. Each application gets its own Performance Score, providing a quick reference to the quality of the user experience relative to a specific Web Application, based on the thresholds defined by a IT administrator. This Performance Score is calculated based on several definable thresholds, primarily per-flow goodput (true payload data rate) and application response time. 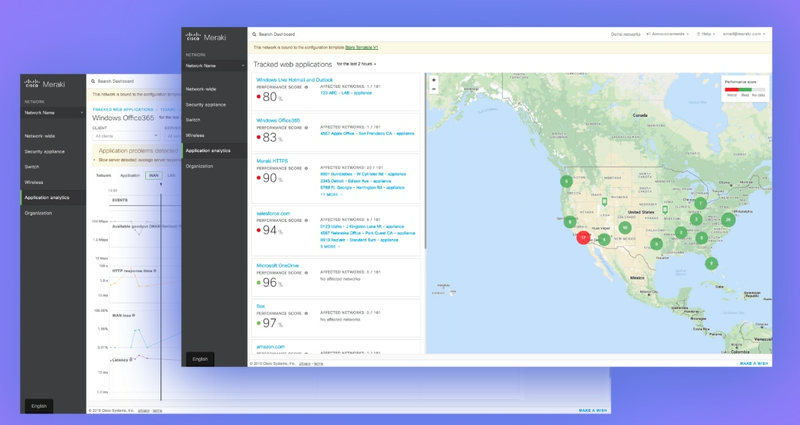 The Meraki dashboard provides rich at-a-glance visibility into how the performance of a specific application is trending over time, enabling IT to more accurately predict where and when challenges are likely to begin impacting the end-user experience. To learn more, sign-up to attend an MX webinar.